A rather trendy cake that has only relatively recently appeared in bakeries, including the likes of Greggs, the humble duffin is something of a combination of both a jam doughnut and a muffin cupcake. Nigella Lawson first talked about making this hybrid muffin recipe many years ago, but it's popularity is really all down to an American baker named Bea Vo, who has made the 'duffin' something of a household name. 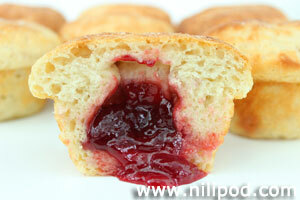 How to get the jam in the middle is what puts many people off making the duffin, as they think that it is necessary to use a special doughnut syringe. However, we find that it works just as well to spoon the jam into the centre of the mixture when you are filling up the muffin tray, just before you place it in the oven to cook. If you prefer chocolate muffins, you could try filling the middle up with a gooey hazelnut spread, such as Nutella. Mix the softened butter (or margarine) together to form a cream and then add a spoonful of the self-raising flour. Adding a little of the flour at this stage will help to stop the eggs from curdling once they are stirred in. 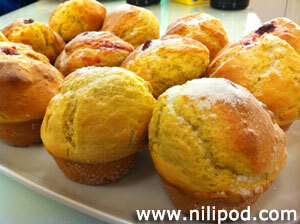 Beat in the eggs, one by one, to create a fluffy batter for your muffins / duffins. Finally, sieve in the flour and fold this in with a large metal spoon, folding until all of the flour has vanished into the cake mixture. 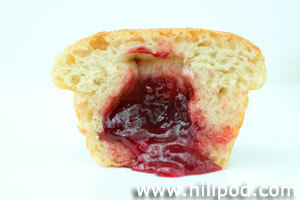 Grease a 12-hole non-stick muffin tray (or use paper cases for this recipe) and fill these half-way with your mixture. Using a teaspoon, make a small well in each of the cakes and then with another teaspoon, add a big spoonful of jam in the centre of the well. Spoon on the remainder of the duffin mixture for each of the cup cakes, so that the jam is completely covered, and then bake at 200°C for approximately 15 to 20 minutes.